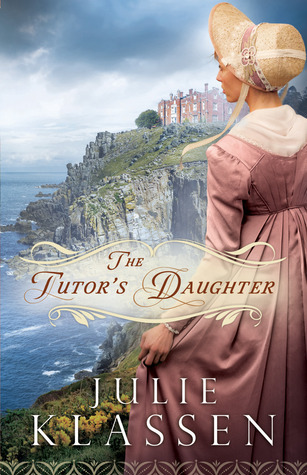 The Tutor’s Daughter is Julie Klassen’s latest Christian Historical Romance. I’ve read and mostly enjoyed most of her books, though my favorite has always been The Apothecary’s Daughter (no, they’re not all titled after someone’s daughter). The Tutor’s Daughter follows Emma Smallwood as she travels with her father away from their fledgling school to become private tutors to prominent family, the Westons. Two of the Weston sons, Henry and Phillip, previously attended the Smallwood’s school and Emma had very different relationship with them. Henry was antagonistic towards Emma and liked to play pranks on her. Phillip was sweet and friendly. And you will never guess who she ends up with. The Smallwoods are greeted coolly by Lady Weston, Henry and Phillip’s stepmother, whose sons, twins Julian and Rowen, are supposed to be tutored. Sir Giles Weston is affable, but generally absent. Also residing with the Smallwoods is Lady Weston’s ward, Lizzie, who strikes up a friendship with Emma, but is hesitant to talk about her past. Emma is tormented through increasingly threatening pranks and a good deal of the story is dedicated to trying to discover who is behind them. Other central themes include discovering the secret of the North Wing, which is figured out about half way through (I found this plot development reminiscent of Jane Eyre); Emma’s growing friendship with and affection for Henry; and Henry’s desire to help rescue shipwrecked sailors, which there is apparently a lot of in their coastal town. I felt like there was too much going on and it was all happening very slowly. The pranks on Emma were mostly nothing more than an annoyance, until the final one that actually is life threatening. The discovery in the North wing was not very surprising and there was too much build up for it. The romance between Emma and Henry, like all of Klassen’s romances, was sweet and probably the most enjoyable part of the book. It felt organic, developing over time and not “at first sight”. The only bad thing I’ll say about it is the cliché of falling for the man you initially can’t stand. But this is no surprise to readers of Romance novels or viewers of Chick Flicks. When it comes to the Christian part of “Christian Fiction”, I feel Klassen handles it well. She is never preachy, which can put off non-believing readers, but she lets the characters’ lives provide the witness. The discussions Henry has with Emma about God seem like natural segues and are never forced. Overall, The Tutor’s Daughter was a quick and pleasant read. It was not one of my favorite Julie Klassen novels, but one I would recommend to those interested in the genre. I would also recommend The Apothecary’s Daughter and The Girl in the Gatehouse. 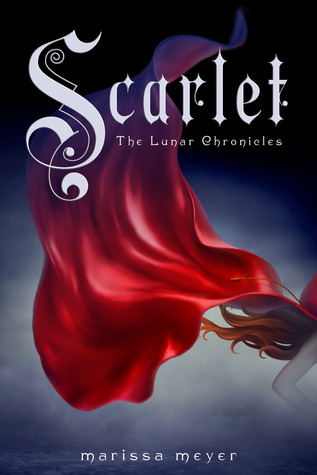 Scarlet is the second book in the Lunar Chronicles series by Marissa Meyer. The Lunar Chronicles are loosely based on fairytales, but set in the future with androids and cyborgs and aliens called Lunars. It doesn’t sound like it would be good, but it is. The first book in the series, Cinder, is based on Cinderella (but in this case she is a refugee cyborg Lunar Princess that the Lunar Queen, Lavana, wants to kill to maintain her authority) and Scarlet is based on Little Red Riding Hood. Scarlet’s grandmother has gone missing and Scarlet sets off to find her at any cost. She joins forces with a street fighter nicknamed “Wolf” (I know, right) who isn’t exactly who he seems to be. Scarlet’s grandmother is the same woman that harbored Cinder after she was rescued from Luna as a child and Scarlet’s and Cinder’s stories converge when Cinder and her fellow prison escapee, self-appointed Captain, Thorne, begin their own search for Michelle, Scarlet’s grandmother. Meanwhile, newly appointed Emperor Kai is dealing with the fallout of Cinder’s escape and Queen Lavana’s threats to attack Earth if Cinder is not found. I usually don’t like sequels that change the main point of view, but I didn’t mind this one since Cinder was still a large presence in the book. The story was told through alternating points of view between Scarlet, Cinder, Kai, Thorne, and Wolf, though predominately between Scarlet and Cinder. I enjoyed all the new characters. We still get to see my favorites from the first book – Cinder, Kai, and Iko, Cinder’s android friend whose personality chip Cinder inserts into Thorne’s stolen spaceship – as well as introduced to Scarlet, Wolf, and Thorne. While Scarlet has some of the teenage girl qualities that annoy me in most YA books (impulsive, blames everyone else for her problems, thinks she can go against people much stronger and more powerful than her, falls in love after a day), I generally liked her. And she and Wolf provided the requisite romance that I was afraid was going to come up between Cinder and Thorne. I liked Thorne. He’s arrogant, but in an amusing way and his bantering with Cinder provides almost all the humor in the book. I was concerned that it would turn into romance that would eventually lead into a love triangle with Kai in a future book (I’m so not a fan of the love triangles), but I felt like it became more a friendship and partnership than anything else. The book seemed a little longer than necessary, but I felt it was paced well, rarely dragging. The change in POV was well placed, not leaving cliffhangers at the end of every chapter only to return to three or four chapters later. Overall, I really enjoyed Scarlet. I think I liked it better than the first book and look forward to the next in the series, which will be loosely based on Rapunzel. 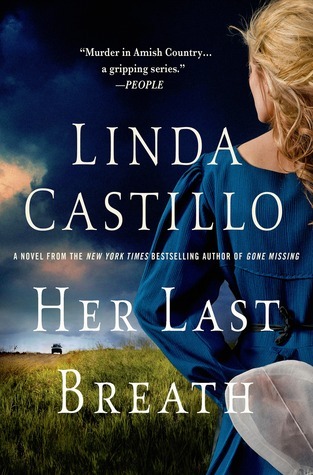 Her Last Breath is the fifth book in the Kate Burkholder series. For those that don’t know, Kate is the Police Chief of the small fictional town of Painters Mill in Holmes County Ohio, which is Amish county. She is a formerly Amish herself. One of my favorite things about the Kate Burkholder series is that I grew up quite close to Holmes County and almost all of my friends growing up had Amish relatives and I went to school with some Amish kids (up until 8th grade, which is the highest they go in public school). I know people that work at Pomerene Hospital in Millersbug, which is mentioned in every book. But I digress. Her Last Breath opens with Kate being the first responder to a buggy accident. It appears to be a hit and run that kills a man and two of his children, leaving a third child injured. They happen to be the family of Kate’s childhood best friend, Mattie. The investigation leads to evidence that it may have been premeditated. This book also continues Kate’s romantic relationship with John Tomasetti, an officer from the Bureau of Criminal Investigation. He’s bought a house in Wooster, the halfway point between where he works and where Kate works and is patiently – at times – waiting for Kate to decide if she wants to move in with him. The third storyline woven in is that the remains of Daniel Lapp (the young Amish man that Kate shot when she was fourteen after he raped her) have finally been found and the police investigation leads straight to Kate’s family, whose farm was the last place Daniel Lapp was ever seen. -The summary for the book includes the phrase,” An extraordinarily beautiful Amish woman, a dangerous femme fatale”, so it’s pretty obvious that Mattie is not the perfect Amish woman she appears to be, but it takes until the final chapters to really reveal this and I felt like I was supposed to be surprised. Maybe I would be if I hadn’t read what the book was about before I read it. -I felt like I needed more information of how Mattie is a “dangerous femme fatale.” In the previous books, the psycho’s psyche has been more greatly explored and I missed that in this book. -The Daniel Lapp storyline was not wrapped up. Obviously this will continue in the next book, which is fine as it’s a central theme in how it shaped Kate to become the person she is today, but I felt like it was just repeating old territory. Kate fears being discovered and what it will do to her, her family, and her career. -Not enough Tomasetti. In the previous books he’s been a part of the investigations, but in this book he mostly stayed at his new fixer-upper house, offering advice and comfort. I understand that his role in this book focused on how Kate needs him as a person versus how she needs him for the investigation, but I still would’ve liked to see more of him in this book. -This book kept the red herrings to a minimum. While the previous books mostly gave several options on who the murderer(s) is/are, this book only gave a few options and I didn’t feel like any of them came out of left field. I like a mystery that can surprise me, but only as long as it makes sense. -While Kate still has her issues, I found her to be more emotionally stable and likable in this book. I appreciate the character growth of both her and Tomasetti. -Overall, it was another enjoyable addition to the Kate Burkholder series that I would recommend to readers interested in mystery/crime, as well as the Amish.